Sorry! I’d like to say sorry for lying to everyone. I’m glad that people were upset that he died. I think my biggest fear was that people were not going to care. Or it would just be, ‘Fine, Jon Snow’s dead.’ But it seems like people had a, similar to the Red Wedding episode, kind of grief about it. Which means something I’m doing — or the show is doing — is right. Jon Snow’s comments to EW also reveal that the actor was asked to keep silent about his character’s trajectory for the 10 months between seasons, which had to be tough, considering Kit Harington appeared in other projects and took plenty of other interviews during that time. It was obviously paramount to the plot that he mislead us, and in this day and age of spoilers Kit Harington did an admirable job. However, that didn’t stop the speculation from running rampant. Before the fateful stabbing even occurred on the TV series, book fans knew it happened in George R.R. Martin’s novels. Many fans have speculated that a resurrection was in the cards, not only because Melisandre has been around The Wall but also because Jon Snow's larger trajectory has always seemed to be an important part of the overall story. 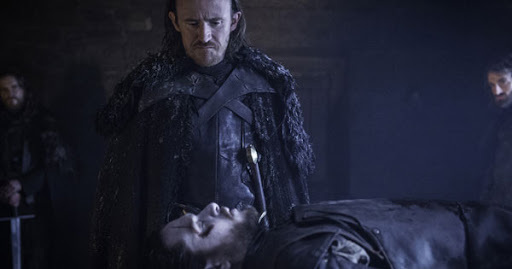 How Jon Snow's resurrection was accomplished was a bit of a surprise. Ser Davos was the instigator of the act, imploring Melisandre to reach deep inside of herself to accomplish the seemingly impossible. She obliged and did a complex spell that involved saying some foreign words and cutting off portion's of Jon Snow's hair. It didn't seem to work, and Game of Thrones lingered on the spell's failure for some time. But then, the impossible happened and Kit Harington's character finally took a breath. We can't wait for this story to unfold. Luckily, this isn't a season-ending cliffhanger. Instead, we can catch new episodes of Game of Thrones on Sunday nights at 9p.m. ET, only on HBO. You can also see what else we know about the upcoming episodes, here.